“It’s about time Cardiff had a museum about the City. About time” says Dan, and I have to agree. In fact, I’ve heard a lot of people say that recently. But, although the new Cardiff Story Museum is good, what most people have actually been talking about is what’s been going on upstairs, above the museum. An exhibition called BigLittleCity, which is the brain child of Dan Green (plus his best mate Marc Heatley). 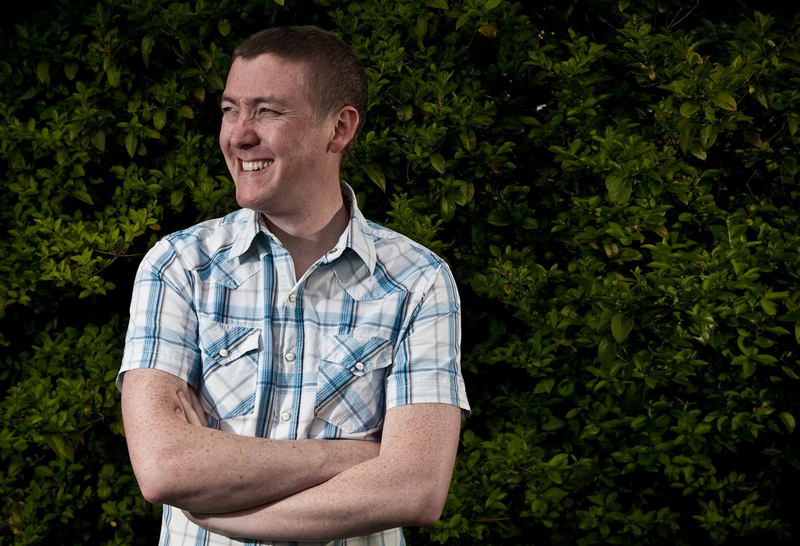 Dan is a freelance photographer, born and bred in Cardiff. Three years ago he started a photography project called Cardiff:Characters, which was all about capturing the unsung heroes of Cardiff – those familiar faces you see everyday. “After travelling in America for a bit I came back to Cardiff with a burning desire to do something. I went into The Old Library, which is a stunning, stunning building in the heart of the city that has never been properly utilised and said to the manager ‘I want to do a photography project about the people of Cardiff and exhibit it here’. He said ‘ok, you’ve got three months’ and I shat myself”. The project culminated in Dan’s first ever exhibition. “It was so exciting. The opening night was bootin’. I manned the exhibition for six weeks. Didn’t get paid for any of it but I was convinced that it would eventually pay off. There was a certain naivety to it, but a good naivety”. Cardiff:Characters was a big success and gained Dan a lot of coverage and plaudits, but it was one piece of constructive criticism that had the biggest impact on him. “Someone came in and said ‘well done for doing this, but it doesn’t sum up my Cardiff. This is just your perspective’. That comment lingered for a long time until I eventually thought ‘ok, let’s do an exhibition where we put the call out and get different people’s perspective of the same thing”. This idea transformed into BigLittleCity, an interactive art exhibition celebrating Cardiff, which ran for three months and ended with a big, creative bang on Friday 22 July. The passion with which Dan speaks about all the work on show is really powerful, it’s almost like a mother talking about her children. “I am so much less precious about my own work now that I’ve done this. I really admire other people’s work”. Dan’s work is pretty good too. His style of photography is incredibly vibrant and engaging and has a distinctive personality (much like himself). “I specialise in photographing people and communities in their natural environment. A strong connection to my subject is vital and I relish the opportunity to get involved in the projects I document”. This need to immerse himself in the subject has led Dan to all sorts of places, from Glastonbury to Ghana, and he is now The Safe Foundation’s resident photographer. But now that BigLittleCity is over, what’s next? “I am definitely going to pursue my photography and I want to visit the rest of the Safe Foundation countries; that has to be done. But having brought BLC this far it would be amazing to take it elsewhere and roll it out in other cities around the UK. I’m very proud of what we’ve done. We’ve been averaging 100 people a day, which is unheard of for this kind of thing, so it could definitely work elsewhere. If you work with the right people and get the right backing it can be a big success”. Whatever happens next and wherever the BigLittleCity adventure may go, we should be extremely proud that it was here, in Cardiff, that it all started. Nice one Dan. “At the age of fifteen I thought I was going to be a Marketing Manager for some big organisation, work my way up the ladder and by the time I was forty do some sort of senior management buy-out, have a top of the range Volvo and 2.4 children”. Not what most teenagers dream about perhaps, but thankfully, things didn’t quite work out that way for Neil Cocker. Neil’s first business was Plastic Raygun records, set up with friends soon after graduating. He spent the next few years travelling the world as one half of Phantom Beats. “I finished University and went and did what everyone else did and got a job in a call centre. But at the same time I was doing some DJing and making a few beats with friends and the next thing you know I’m waking up in a jacuzzi in Miami, playing gigs all over the World, and getting a phone call saying we’ve got a top ten hit”. Bonkers. Neil never really earned any money from his time in the music industry but, more importantly perhaps, he realised what he wanted out of life. “That was my driver. To do more of that. To get that sense of achievement, do exciting stuff and meet interesting people. I also knew that I couldn’t go back to a desk job”. And boy has he stuck true to that. 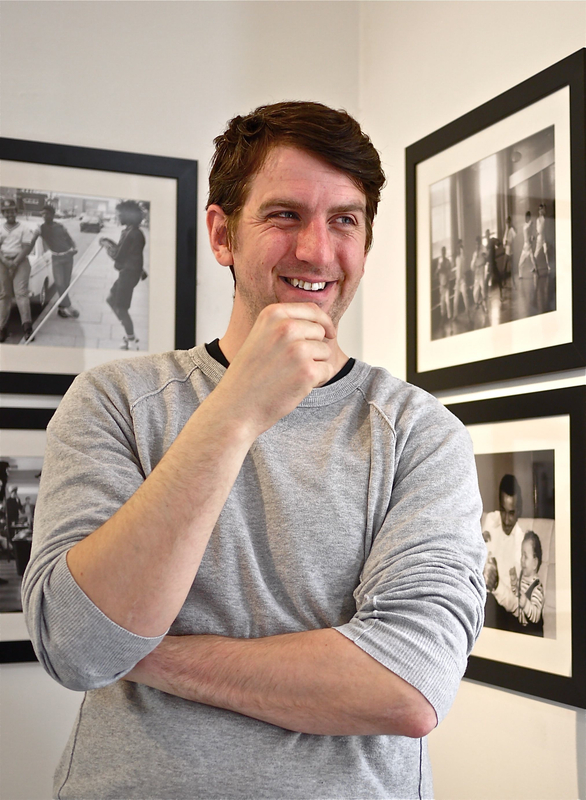 In 2007, after a rather depressing experience in a business network meeting, Neil founded NOCCI – a global network of creative, entrepreneurial people. “I was in this room with lots of white, middle aged men in suits thrusting business cards at each other and I thought there has got to be a better way to do this? So, he set up a Facebook group and within two days had over 150 people queuing up to be involved. “Things like Facebook events make it easy to dip your toe in the water without making an arse of yourself”. Alongside Claire Scantlebury, Neil also runs Ignite Cardiff, “a regular informal community event that encourages people to share their ideas, passions and thoughts in five minute rapid-fire talks”. They also jointly-run TEDxCardiff, an event that brings world-class speakers to Cardiff in order to “inspire, inform and entertain”. Both events are free and are organised voluntarily. “I like bringing creative people together from lots of different disciplines. It’s a well-proven psychological phenomenon that the decision-making ability of a group is in direct relation to its diversity. So, give a bunch of 35-year old ad executives a problem and they’ll crack on and solve it. But put a truck driver, an old woman, my girlfriend and a school kid together and they’ll come up with better, quicker or more interesting solutions. It’s all about different perspectives”. Neil is also a “creative industries consultant”, working with lots of organisations, including the Welsh Assembly Government, helping them engage with creative people, and he also sits on the board of directors for the Welsh Music Foundation, “helping it represent, support and develop the commercially viable music sector in Wales”. But Neil’s big project is Dizzyjam. A brand new merchandising service for the independent music industry. It is essentially a t-shirt printing company that works with bands to create merchandise to sell to their fans. “It allows bands to have their own online merchandise store that doesn’t require any outlay. This makes it easy for them to sell their stuff without having to spend loads of cash up front”. You could be tempted to describe Neil as a bit of an ideas man, but he doesn’t share that view. “The reason I’ve ended up having a reasonably creative, entrepreneurial career is by accident rather than design. I don’t believe in that strict sectioning off of people who are ideas people or doing people. I genuinely believe that everyone can do it. It’s just the way you’re bred to think. I wasn’t one of those people selling sweets in the schoolyard at the age of seven or earning £400 from my paper round. It has been a natural mix of luck and talent of the people involved”. However he got to where he is, he is satisfied with how things are turning out. “I enjoy what I do to make money. For me, entrepreneurship has never been about great wealth. I’ve never really wanted the mansion, the yacht or the pool or whatever. I would quite like an Aston Martin but that would be the bonus. For me, it’s about waking up on Monday morning and going ‘yes, I love what I do’. I don’t want to die having not had an amazing time and having done interesting stuff”. During our conversation, Neil kept using one word time and again – lucky. I think Neil’s success is down to a lot more than luck though. He’s definitely earned his success. He is clearly very talented, very hard working and is interested in everything and everyone. He is easily one of the nicest people I’ve ever met. He may not have been born here but Neil calls Cardiff home. I think we should count ourselves lucky to have him. Marc Thomas is working on a dream. “When we’re young we dream of doing something great. Most people dream of being famous, but then they go to university, live off of mouldy pasta for 4 or 5 years and at the end decide they prefer the security of a full time job”. But, unlike many of his peers, Marc has chosen a different path. He’s going it alone. Marc is editor and owner of Plastik Magazine (formerly Journal of Plastik), an “on-line magazine of culture and things relating to creative culture”. The aim of the magazine is to “represent the creative atmosphere of one of the world’s most vibrant cities – Cardiff. The city is up and coming and producing a vast amount of incredible creative talent. Plastik Magazine exists to document the flux of the city”. Marc acted on impulse when the idea for the magazine came up. Instead of thinking through a web strategy or developing a business plan he decided to be reckless and just do it. “Personally, I feel uneasy with the idea of just getting a job out of comfort. If I were working for a magazine or newspaper I would seldom get the chance to work on a project like this. I’d be constrained to writing features that might not be all that interesting. This might be the only opportunity I will ever have to be so free in journalism and business – If I don’t take it now, I’ll probably end up feeling bitter and ruing the day I took the easy way out”. Wise words, but also quite brave for a 22 year old fresh out of journalism school. Plastik Magazine has gained a loyal readership in a short space of time, but over the past few weeks, with the end of his University days fast approaching, Marc has been focused on turning Plastik Magazine from a journalism project into a fully-fledged business. “I’ve been working hard on building revenue streams into the website and creating new ways to build community at the same time. There’s a big problem of how to make online journalism profitable and not sell out. Plastik Magazine wants to help local businesses, culture and customers connect and also continue to be able to afford to provide our readers with brilliant content”. It is this dilemma that has led to Marc’s most recent venture – the Plastik Pass. The pass is a discount card, which costs £5, lasts six months and gives lots of unique offers and discounts at local, independent businesses throughout the City. “The Plastik Pass is my proudest achievement to date. It’s a cord of three strands: community, revenue and culture”. Marc’s hope is that by buying a Plastik Pass you’re doing two things. “Firstly, you’re saving a whole bunch of money, and secondly, you’re supporting loads of great local businesses and helping to promote our unique culture, which is something you can’t really put a price on”. Marc’s creative juices are clearly is constant flow. So much so he has developed a post-it system to capture and prioritise his ideas. “If there’s something that needs doing I get very excited about the blank page in front of me”. However, he stresses that one thing he’s learning is that it’s very difficult to come up with a brand new idea. “Originality is hard to come by. These days, to get to the front of a crowd, you just need to be better at walking through gaps”. Similarly, Marc realises the importance of a good support network. “There’s a lot you can do on your own, but you can’t do everything. At some point you have to listen”. Marc is not a native. He moved here five years ago, like many others, to study at University. But his love for Cardiff is clear and there is no doubt that he has worked hard to become part of the community. I wish I had contributed as much during my student days. Marc didn’t quite fit the picture I had in my head of someone who is deep into the music scene, an entrepreneur, promoter, and journalist. I’m not sure what I expected, but he wasn’t it. Marc was so much nicer. In fact, you’d have trouble meeting a nicer bloke. They say nice people don’t get very far in business, but I have a funny feeling this one will. Best of luck Marc. Marc is an editor, journalist, writer and song-and-dance man. He is currently the editor of culture e-zine Plastik Magazine, the brains behind Plastik Pass, a regular blogger and lover of sensual print layouts. He is tweetable on @iammarcthomas and would love to hear from you. 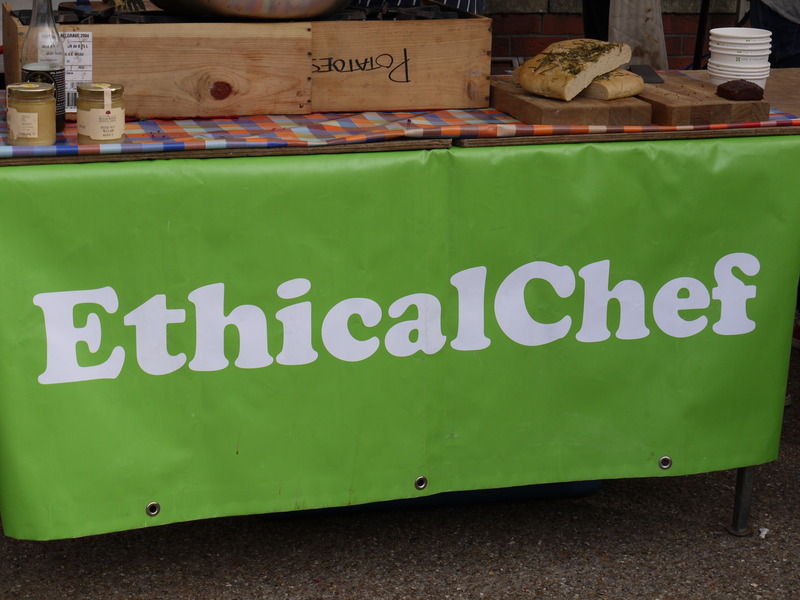 A lot of you will probably already know about Mr. Deri Reed, or his alter ego the EthicalChef. For those of you who haven’t heard of him, the chances are it won’t be long until you have. 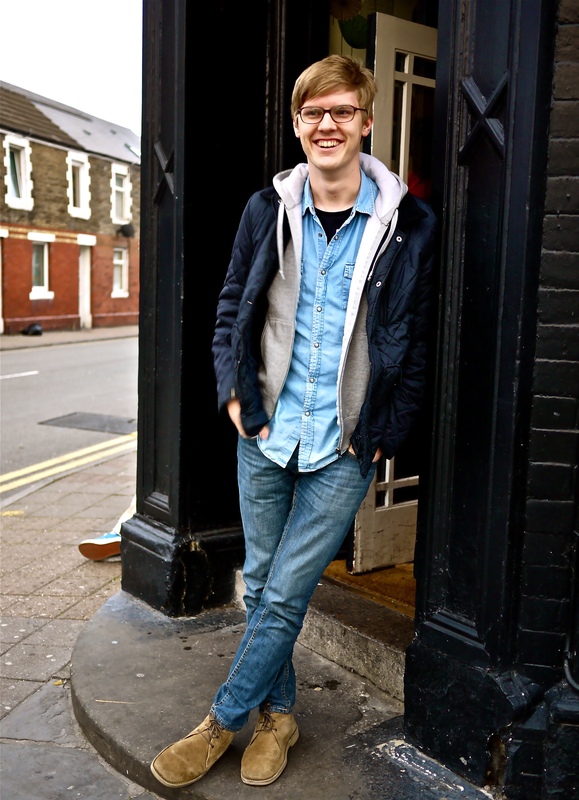 Deri is essentially a vegetarian chef living in Cardiff, which isn’t that crazy or exciting perhaps, but this young man has literally burst on to the City’s food scene over the last year or so and really caught people’s attention and imagination. For the past 8 months, he has been running his own stall at Riverside Market selling freshly made food using produce sourced from his fellow stallholders. In March this year, he started a pop-up Supper Club in Riverside to get the community together for good food at a good price and to “show people that there are great alternatives out there that don’t need the use of meat”. As a meat eater myself, there is no reason why I should particularly care about what Deri is doing, but it’s the way he has gone about doing it that I find really inspiring and motivating. “I deliberately didn’t do things everyone tells you you must do, like business plans, I just went in with passion, drive and enthusiasm and got out there and did it. You can’t just sit around and wait for things to happen.” Passion and energy are words that are all too often used to describe people these days, but they really do just ooze out of this guy. Anyone who has met him will know what I mean. “What frustrated me about myself was the fact that I was saying ‘we should be doing this, we should be doing that’, so one day I woke up and said ‘just do it then you idiot’…so I started doing it”. Simple as that! Deri has many of the classic traits of an entrepreneur. He is confident, driven, impatient, very serious about what he’s doing and great at selling his ideas (and vegetables!). Like many entrepreneurs, however, Deri is already looking for his next challenge. “I’m at a bit of a juncture. Do I want to spend my whole life feeding people? I don’t know if that’s my calling. At the moment I’m wondering where I should go, what route I should take”. The answer may well have arrived. Deri has recently made contact with the good folk behind The People’s Supermarket (as seen on Channel 4) with the aim of setting up a similar venture right here in Cardiff. “What TPS has done in London is astonishing, they’ve basically signed up 500 volunteers to run a supermarket in the centre of London. The project has been so successful it has inspired me to look into it a little more to try to make it happen in Cardiff”. Different to his other projects, this is not a one-man show and the success of it relies on people like you and me, “It’s still very early days. I’m waiting until 100 people sign up to the mailing list before arranging the first meet up where we will just start to get to know each other and share what skills or contacts we have that might be able to help”. If you’re interested, sign up here. What I really like about Deri are his principles. “I’ve always said that I won’t compromise on my values. I’d rather not have the business to be honest”. Similarly, “when you’ve got a good product, it’s the easiest thing to sell. But if you haven’t, or you don’t believe in it, it is impossible to sell. You have got to love it”. That’s why I think Deri is so popular. He clearly loves what he’s doing and believes in it 100%. He is also very much a 21st Century businessman. Social media has been critical to his success and developing his brand and he clearly understands how to connect with people. But Deri is very quick to point out that he is no superman. “Running your own business can be lonely. No one else is going through what you are so you can’t really explain how you’re feeling. But, I am lucky to be around a lot of support networks – my parents are nearby, my brother is here (in Cardiff), and my friends and volunteers have kept me going”. We are very lucky to have someone like Deri Reed in Cardiff. He’s a do-er and is making exciting things happen. There is a definite buzz surrounding his work. He also cares about the important things in life – people, food, health and the environment. If ever there was a good role model for our kids, this is the man. 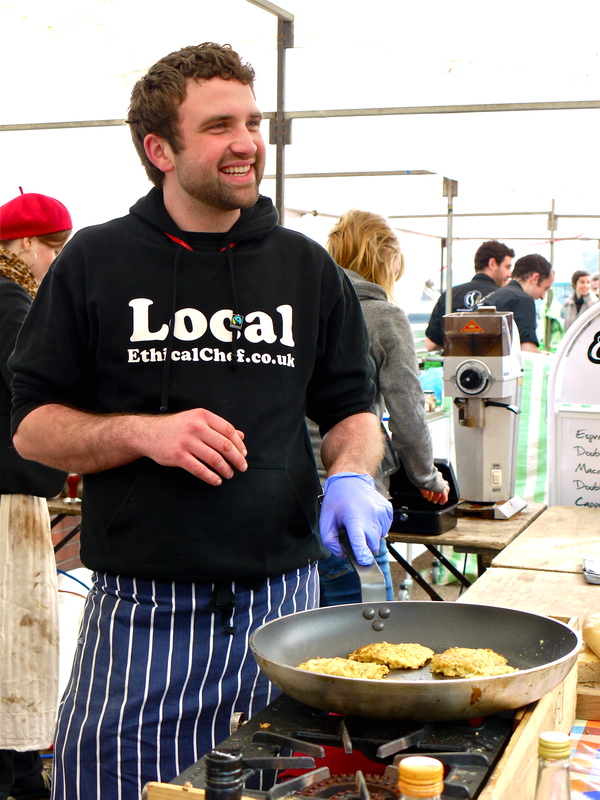 EthicalChef will be appearing at the Cardiff Vegetarian Festival on Sat 21st May and will be doing other events as part of National Vegetarian Week 23-29 May. He is gathering interest for The People’s Supermarket in Cardiff and, if you’re interested, you can sign up here. Amy Davies is the perfect person to kick off this blog. She sums up exactly what it’s all about – she had an idea and acted on it. Simple. She has started the Cardiff Arcades Project, which aims to “document the Victorian and Edwardian shopping arcades in Cardiff, home to some of the quirkiest, individual and independent retailers in the city”. It’s an idea that has really captured people’s attention and Amy has been “overwhelmed by the positive response (she has) received so far”. It basically involves Amy going in to the shops, taking photos and chatting to the owners and recording it all on her website. Again, it sounds simple but it just hasn’t been done before and that’s what makes it so bloody good. The idea came on her way home from work one evening. “I was wandering through Morgan Arcade, taking a few snaps for my Project 365 and on a whim I thought, maybe I should do a project on the Arcades, that would be pretty cool”. With the help of a few tweets “the project went from a thought to a full-blown project in about 12 hours”. What started out as photography project, however, has become so much more than that. “One of the main reasons for doing the project was to take more portrait photos but I found that all sort of stories naturally come out through talking to people. The photos may be good but they’re made even better by knowing a bit about the person behind the face – the story adds to it”. I have a feeling that Amy’s project will go a long way to restoring people’s interest (and spending) in the Arcades and raise their profile once again, although Amy is quick to play this down, “maybe a few people have found out about them through my blog, I don’t know. I have had a few messages from people who hadn’t discovered or heard about a particular shop before. That makes me feel really happy. It’s also nice to know that people are actually reading my blog and that it may be having a positive effect on people”. You can say that again. After spending some time with Amy it is quite obvious that the project is also having a very positive impact on her too. “I’m quite a shy person but this project has made me so much less shy. I’ve met so many fantastic people, done so many things and had an unbelievable time in just a few short weeks”. She is now making new friends, good contacts and even gaining some paid work from the people she’s meeting in the arcades. How cool is that? I really enjoyed meeting Amy (in New York Deli, High St arcade by the way). I’m really chuffed that she had the guts to turn her idea into reality and I’m sure there are a lot of shopkeepers who’d agree with me! 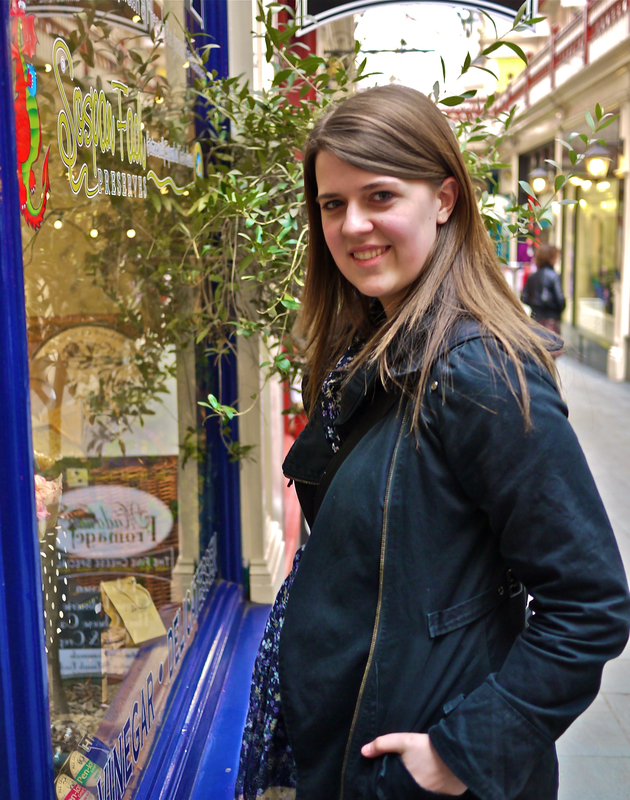 Check out her website and, more importantly, check out the shops and the arcades – they’re wicked. Amy Davies is a journalist and photographer living in Cardiff. Having moved to Cardiff 5-and-a-bit years ago for University, and never having the decency to leave, she now calls it home. During the day she boards the train for her daily commute to Bath working on a photography website, and most of the rest of the time she’s either taking photos, writing things, baking cakes or a combination of all three. Cardiff is a city that’s yet to reach its full potential. But everywhere I turn there are amazing people doing amazing things. Lots of the time it makes me think “crikey, I’m so lazy. Look at all these people doing all this stuff”. Other times it just makes me smile. Either way, I’ve decided I want to meet these people. Some I know, some I don’t, but I want to meet them, listen to their stories, soak up their enthusiasm and creativity and share it with others. If I can inspire one other person to do something great by sharing stories of those who already are, then I’ll be a happy man.